But if you start to use it, you may notice some drastic change. For example, if you navigate to the phone settings, you will find the revamped UI. The round icons in white background looks so beautiful (maybe not good for battery for AMOLED screen). You can also swipe among tabs after getting the Android Lollipop update. Although Samsung hasn’t fully embrace material design in this Galaxy S4 Android Lollipop update, you should find the new UI is more beautiful. You may also feel your Galaxy S4 a bit faster. Galaxy S4 is often cited as a bad example of bloatware. Apparently, Samsung slightly trimmed down the TouchWiz. But you should not expect dramatic improvements in performance. New notification and interruption is one of the top selling points of Android Lollipop. Although Samsung slightly spoiled the elegance of the new notification and interruption in favor of their own way of handling notification and interruption, Galaxy S4 Android Lollipop update still brought more than 90% of the new Lollipop notification features compared to the stock Android (e.g., that in Nexus 6). You need fine tune the new notification and interruption to get exactly what you want. For some impatient Galaxy S4 owners, they may feel frustrated at the beginning. If you have any question on using Android Lollipop new notification and interruption (e.g., how to set up priority mode, how to silence Galaxy S4), please check this guide. Smart lock is another extremely useful feature in this Galaxy S4 Android Lollipop update. Your phone can be unlocked automatically when you are in certain location, or your Galaxy S4 is connected to certain Bluetooth devices. Unfortunately, a lot of Galaxy S4 owners failed to find the smart lock option after the Android Lollipop update. You need enabled trusted devices first. Then the smart lock will be shown in your settings. Please check this guide on how to enabled and use smart lock in Galaxy S4 after Lollipop update. With the Galaxy S4 Android Lollipop update, Samsung also updated their own apps. Most of the apps are updated with partial material design with an action button. Of course, they look far better. For example, the green phone app looks really appealing (arguable). The navigation through tabs using gesture (swipe) is also supported in most apps and settings. What should I do before getting Galaxy S4 Android Lollipop update? If you haven’t got the Galaxy S4 Android Lollipop update, it can reach your S4 at any time. But it is not necessary to check the update every a few hours. You just turn on Auto-update in Settings—About device—Software update. You should get an notification once the update is available for your Galaxy S4. Please also enable WiFi only unless you have unlimited mobile data plan. The download size is about 1GB. You need keep 1.5-2Gb free space for the update. So, backup your files and settings to the PC with Kies, and clean the phone to free some internal storage. Actually, you should do this even if you are not interested in Android Lollipop. 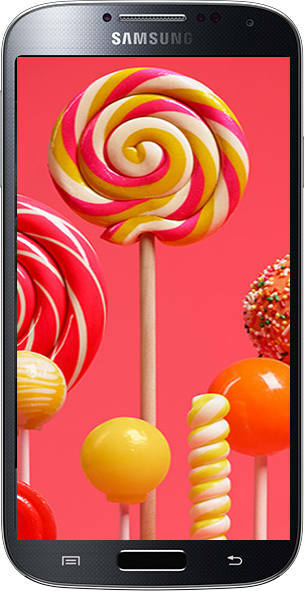 What should I do after getting Galaxy S4 Android Lollipop update? Some Galaxy S4 owners feel the phone behaves weirdly, or feel the phone is slower and less responsive. Sometimes, the system apps (e.g., messages app) crash frequently. If this happens to you after the Galaxy S4 Android Lollipop update, you can try to clear the cache partition. This can solve most of such problems without losing any of your settings or files. Please follow this guide on how to reboot Galaxy S4 into recovery mode and clear cache partition. Of course, if wiping cache partition does not solve the problem, you should backup the phone and do a factory reset. Do you have any questions on Galaxy S4 Android Lollipop update? Please let us know in the comment box below if you need help on Galaxy S4 Android Lollipop update. Lollipop update for AT&T Galaxy S4 (SGH-I337) has been available for some quite long time already. You can check it through OTA (settings–About device — software update) from your phone. Only the phone dialer shortcut now appears on the lock screen. How do I add other widgets?